The roads were clear in D.C. when I left two Thursdays ago and mostly clear when I returned Friday morning. I’m a little sad about what I missed. Last weekend’s blizzard was the first epic snowstorm I’ve been out of town for since… college? I not only don’t mind being around for a foot or more of snow, I enjoy it. I take pride in my snow-shoveling and snowman-building skills, I’ve got a decent set of snowbound-comfort-food recipes, and getting over six inches of snow has been a great excuse to dust off my cross-country skis. Alas, I couldn’t do any of that because of travel I’d already arranged. I could only check Facebook and Twitter from afar to see everybody else’s updates, pictures and videos as inches of snow turned into feet. But even if I’d been in town, I couldn’t have enjoyed any cross-country skiing. One of the aging skis I’d gotten for free at a friend’s yard sale long ago suffered a complete delamination last year, and I’d held off on buying a replacement pair because I was afraid that would ensure we’d never see any snow this year. 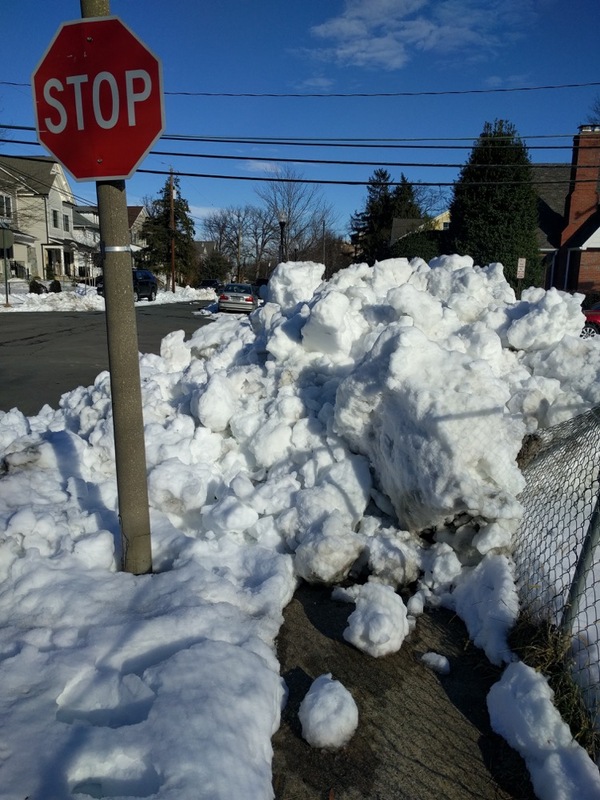 Yes, you can go ahead and blame me for Snowzilla. Fortunately, there was still some snow shoveling left for me when I returned: Friday morning, I cleared a path to the grill and the compost bin, and this morning I dug out the two closest bus stops and our kid’s school-bus stop. My next snow-related move will be buying some x-country skis, which I hope won’t stop us from getting a little more snow before spring arrives and I must return my attention to gardening. This entry was posted in Local news, Personal, Travel and tagged #Snowzilla, blizzard, cross-country skiing, snowstorm by robpegoraro. Bookmark the permalink.